How Would Winning Be Different Than In 2004? I remember arriving early at game 1 of the 2004 World Series. I felt enormous excitement, of course, because of the almost unthinkable possibility of finally winning it all. But I also felt enormous dread. Those of us who had endured our share of Red Sox pain felt reluctant to even give ourselves permission to imagine what it would be like if we actually won the Series. We had let ourselves imagine it vividly a few times before (game 7 of 1975, 9th inning of game 6 in 1986, game 7 of ALCS in 2003), only to get burned. Badly burned. This year, it’s different. It’s easier to imagine what it would be like to win the World Series. There’s no dread whatsover. Certainly, the fact that the Yankees (and Mets) have already been eliminated helps. And it’s not as painful to imagine losing. Yes, I imagine a bad taste in my mouth at the thought of losing to the Indians, and a really rotten taste in my mouth at the idea of losing to the Rockies or Diamondbacks. But because we vanquished the curse in 2004, the current postseason is about 2007 only, not about 1919 and every other year we failed since then. On Opening Day in 2005, all of us members of Red Sox Nation hit the “restart button” on our emotional lives — and the ensuing three years of futility haven’t been enough to cause a distressing World Series drought. So how would a World Series victory in 2007 be different from the 2004 triumph? 1. The celebration would be pure fun. No convulsions, no heart attacks. In 2004, the celebration was an orgasmic exorcism, almost painful in its joyousness, if that is possible. Of course, the fact that we were about to get swept by the Yankees until Millar walked, Roberts stole second, and Mueller knocked him home – and then we staged the greatest comeback in sports history – played a big role in our eventual ebullience. And yet we sort of expected some unknown force to take the trophy away from us even after the last game vs. St. Louis had ended. When the Cubs finally win it all, we’ll see that kind of craziness all over again. 2. We would feel like World Champions immediately after the final out. In the aftermath of the 2004 victory, it literally took months for our old identity as “lovable chokers whose Daddy is the Yankees” to fade and our new identity as “World Champs” to sink in. 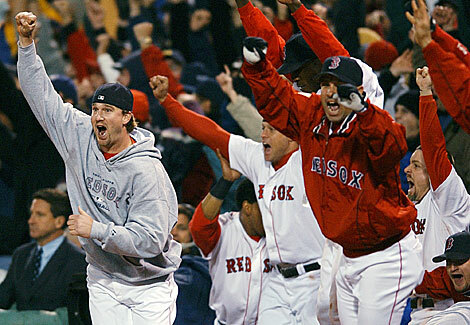 Pre-2004, part of the pride of being a Red Sox fan was having the courage to “keep the faith,” and by wearing the blue hat with the “B” on it, we proclaimed to the world that we were sticking by our guys, no matter how horribly they had screwed up our lives. During the winter of 2004-2005, we all woke up every morning and thought, “I had the weirdest dream that the Red Sox won the World Series — oh my gosh, it’s true!” Because we’ve rehearsed the feeling of being a champion, another World Series triumph would feel like putting on an old, broken-in baseball glove (except better). 3. We would suddenly be perceived as one of the premier sports franchises of the 21st Century, by virtue of winning two World Series in four years. There would be several players on the team with TWO Red Sox World Series rings (reminiscent of the early 20th Century Red Sox players, who won it all in 1912, 1915, 1916, and 1918). John Henry, Larry Lucchino, and Theo Epstein would establish themselves as one of the best (if not THE best) owner-president-GM trio in sports today. And Terry Francona would have to be considered one of the elite managers in baseball…. and a bona-fide Hall of Fame candidate. 4. Kids in Red Sox Nation, who were fans in 2004, would officially grow up with a warped sense of what it means to be a Red Sox fan. (Or perhaps it’s us long-term fans whose perceptions are warped…. permanently damaged by the pain of pre-2004.) And this means that kids from Yankees Territory would officially grow up with a warped sense of what it means to be a Yankees fan. Doesn’t that idea make you happy?